I'm looking to rehome B.C., my blind cat. I adore her and I've known her since she was only a few days old, I stall visit her mother, sister, and other relatives on occasion as well- they are all strays in a nearby small town. I'm rehoming her because, though I do love her, I simply don't have the time or space for her anymore. She has spent most of her life in one room of the house, as she needs some work on her litter box habits. She is very sweet and will cuddle with me for hours on end, when I sleep in her room with her she sleeps on my back or my chest and she always kneads on me. 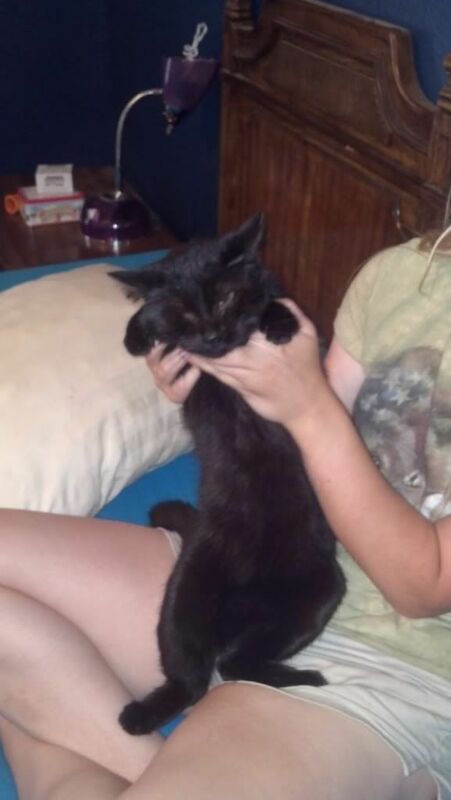 She is petite, about 7 to 10 pounds and very active, she will chase flies and play with rattle balls until she loses or stashes them and will even run around the house. Right now, I no longer have a safe place for her to run. Her room is about to be taken over and there is no where else for me to move her. And, I just adopted two more pups. She has been allowed out less and less since I adopted my second dog 7 months back and now that I have four there is no way for her to roam around safely. She does well around calm adult dogs, in-fact she grew up with my mutt and they used to sleep together all the time. They even wrestle around and have slap fights when allowed. She does well with other cats that are respectful of her, but she would not do well with young cats that may bully her. She is not a finicky eater, on the contrary she'll eat just about anything. I'm feeding her 4 Health right now, which is a step down from TOTW and she does well on it. I'll be rehoming her with her food bowl, auto waterer, and all three of her litter boxes, only two are active right now. I'll take some pictures of her once someone gets up to help me, she is pure black and, of course, eyeless. If you're interested in adopting her and would like any background information, feel free to ask. Good luck to your little one! I wish I could help, I sure would if I could. - Raaz. Also, to those interested my mother just informed me that we would be able to drive a few hours in any direction to get her to the right home. can you please PM me with more details and a current photo? Being blind may be in an asset in this case, which is good, because being black surely isn't. I had no idea that black cats are hard to rehome! IF there is a link between coloring and personalities, black cats really seem to be pretty chill. I wish the luck for your little one. (And I love black cats, BTW!) Yay! Yes, I'll pm you right away. Last time she was weighed she was 8 pounds and her most recent pictures... aren't very flattering, cause she was being a grump. I discovered today that after only 5 minutes worth of loving and scratching on her makes me break out in hives. Lately, she hasn't been loved on much except for a kiss and a few scritches when I'm cleaning her boxes or in the morning when I go in to feed her. My allergies to her had started as very minor, and easily ignored, but this is just adding to the reasons she needs to go to a new home. Would you be willing to do that, if a home can be found out of state? I will start posting her info right away. she looks like a real sweetheart. Just wanted to bump this and see if anyone else is interested. So far, I've had several people nearly take her and then just drop communication completely, and I'm still waiting on any information from petunia's friend. I really need to rehome her. I'm giving it another week or two and then I'll contact all the no kills in my area (for the 3rd time) and see what my options are. I can't even go in her room anymore without my nose stuffing up and getting a major sinus headache. And I'm finding less and less time for her as the pups keep growing, plus, I'll be back in school in about a month and then my time will be severely stretched. are you able to get her to a vet to get checked out and vaccinated? I agree she's a beauty! Grumpy can kind of be adorable. I wish I could take on a new kitty right now, though I'm also...REALLY far away! I'm sorry to hear about the allergies. Mine to dogs is about the same minus the hives and plus asthma! Best of luck to her and you! We're working on getting the funds together, the day after we got our pups to the vet to get their first set of shots my mother lost her full time job of seven years. Now she only has a part-time job and we are really strapped for cash. I'm going to call the Humane Society again and see if they have a foster that could take her, that's our best bet because they'll get her all of her shots, spayed, etc. I'm sorry if it's a repeat story, so I'll PM most of it, but SOMETIMES calling a trusted vet can help with rehoming/fostering. Anyone with questions do just PM me. I called around and no one is really interested, I sent e-mails to all of the rescues/no-kills in my area and so far I've only had two replies. The Humane Society, so far, gives me the same answer no matter what I ask them, so I think it may be automated. And, the SPCA may take her, I'm hoping that they do, right now my e-mail is being sent through the proper channels and they're figuring out whether or not they have room, funds, etc for her. Blindy is still available for adoption. I'll be checking back with the SPCA and Humane Society sometime later next month to see if they have any fosters open then, but for now I'm still looking for someone to take her in. Personal time searching rescues in your area may help, too. Not all are open to "differently abled" kitties, but if she's healthy aside from being blind, maybe. Internet work. Phone calls. (Sorry, I don't know your area). It's always worth a try. I've called all of the local rescues, vet clinics, even a few individuals that were recommended to me. No one currently has space or fosters, so, for now I'm just waiting to call back to the HS and the SPCA. I spent a week earlier this month calling everyone a second time just to be sure, I was greeted by several rude and obviously annoyed receptionists and others gave me the same tried and true tips that I was already putting to use. Thanks for the well wishes, though. I'm really hoping I find someone, or an organization, that can take her in. Well, after a few months of searching, I had been unable to find Blindy a home. Even after I went back through my list of local, and not so local, vets and no-kills. 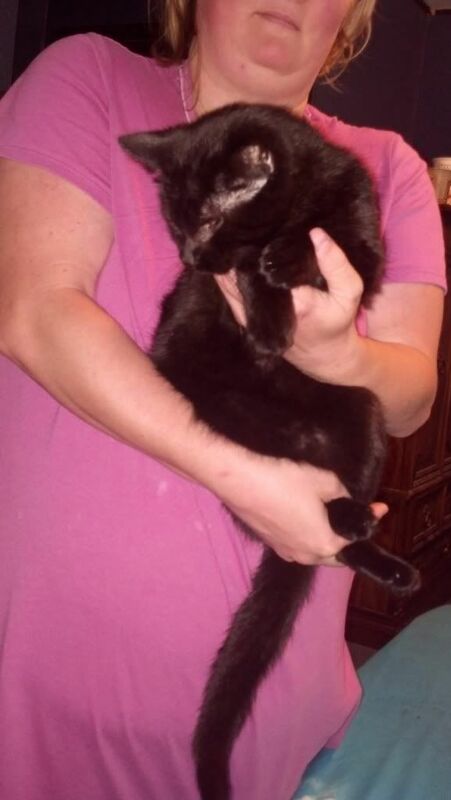 I had my mom take Blind cat to our local animal control a few days ago. I hadn't wanted to and I felt terrible about the decision, but I thought of it this way, she would have 3 more days to find a home and if not would be humanely euthanized. My colt was severely beaten by a pasture-mate and was taken to the vet Tuesday morning, turns out that our preferred, local vet works with the local animal control who brought in Blindy for boarding there. Good News: Blindy is such a sweetheart that one of their vet techs fell in love with her and is taking her home! Bad News: After two days and nights at the vet Scoundrel, my colt, passed away. Even just typing this makes me tear up as I was only just informed this morning.